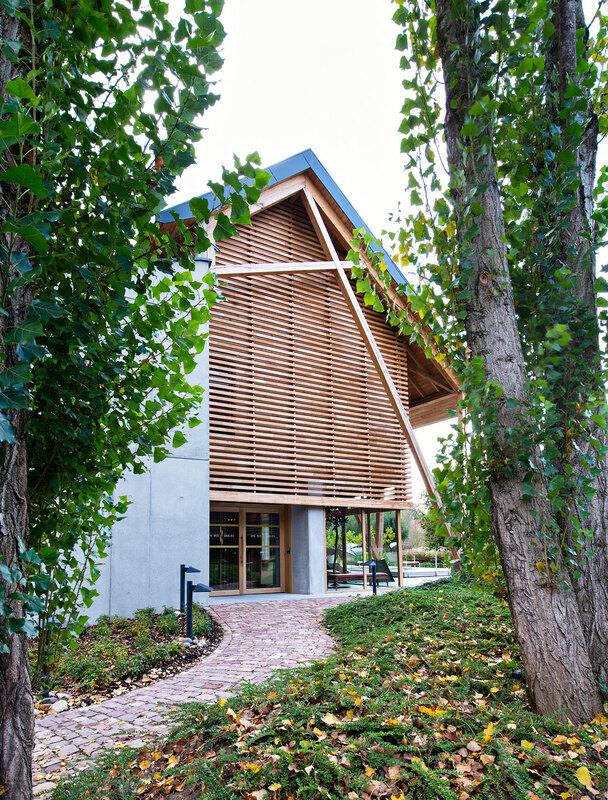 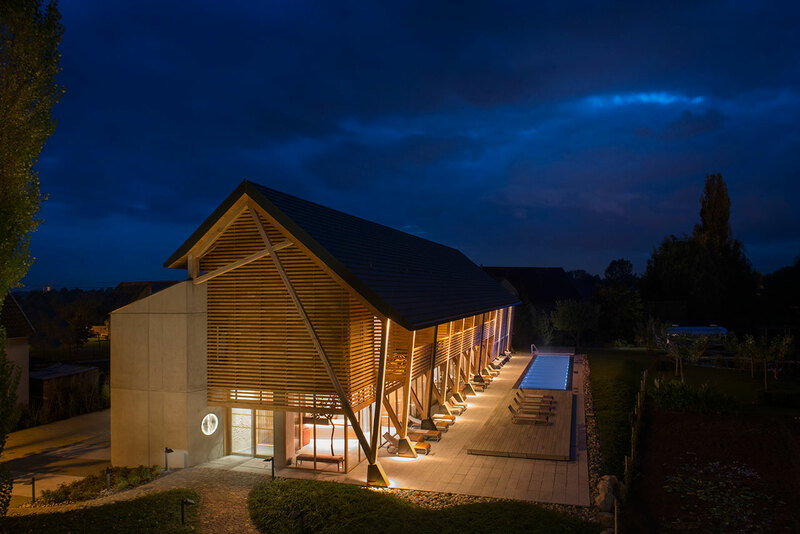 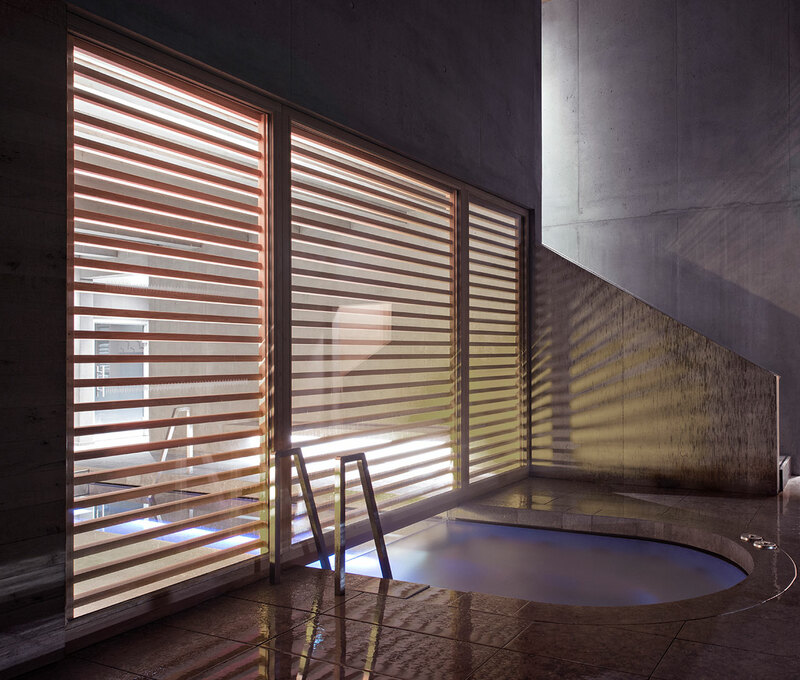 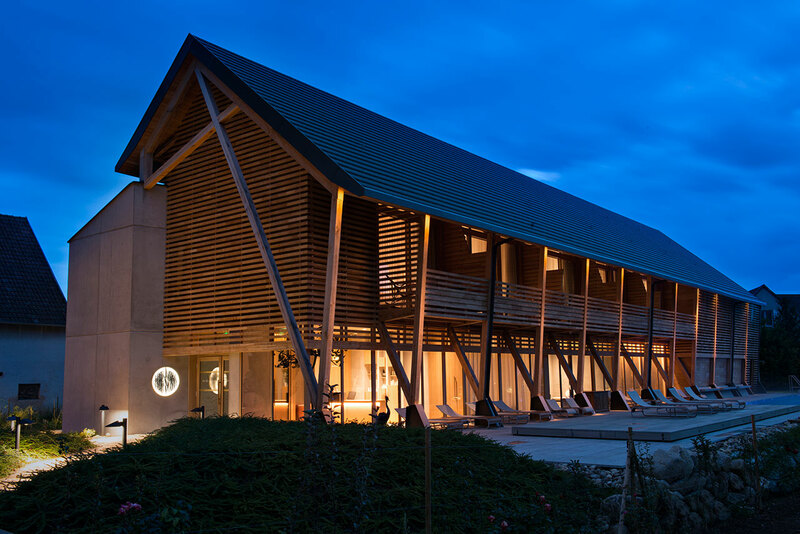 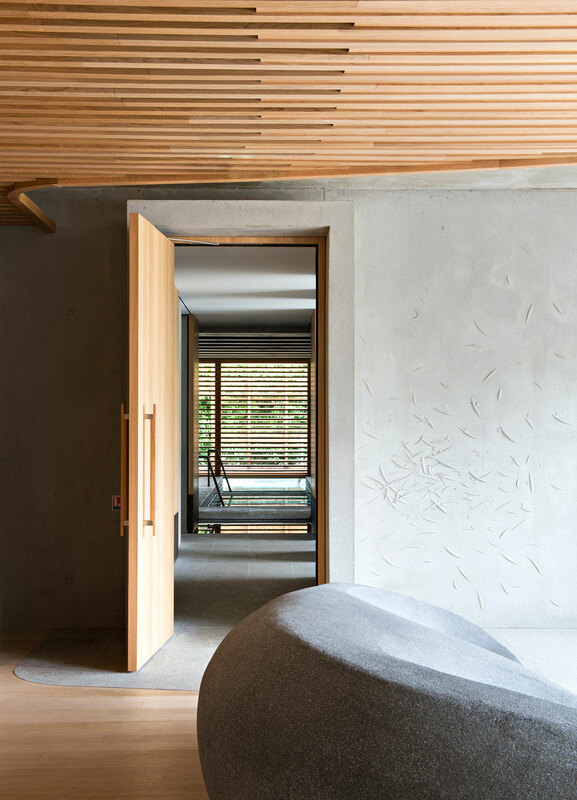 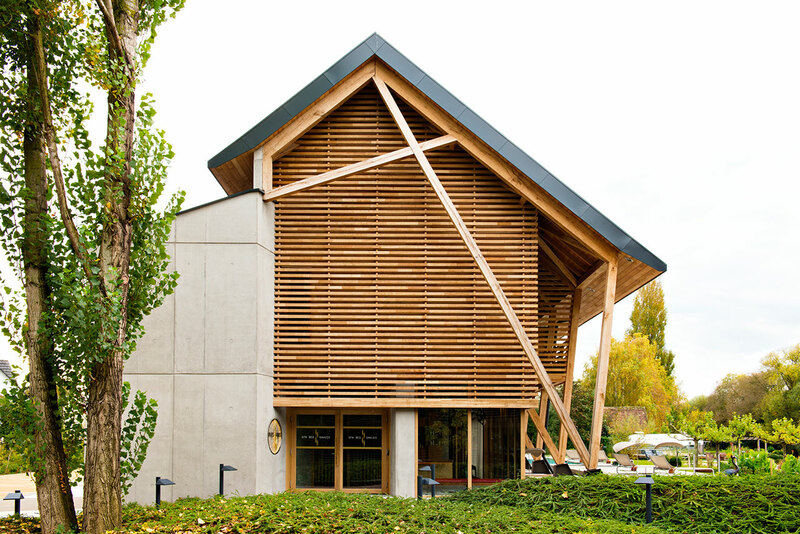 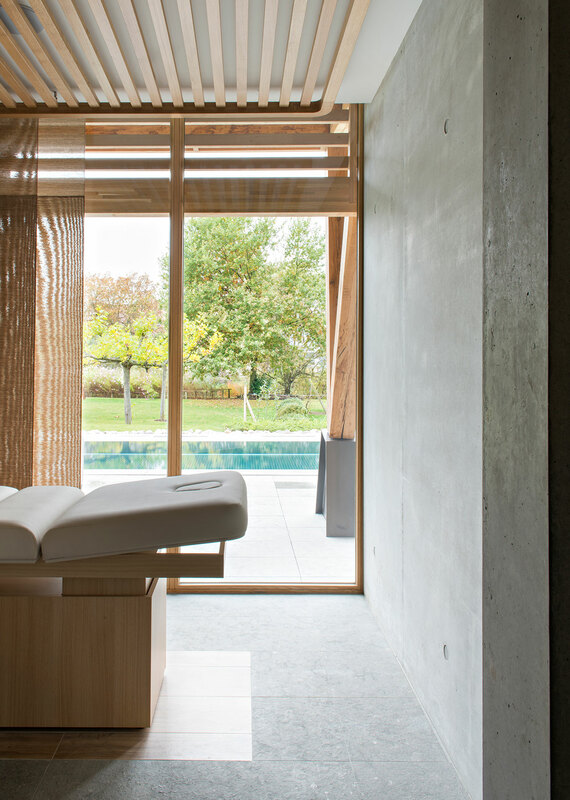 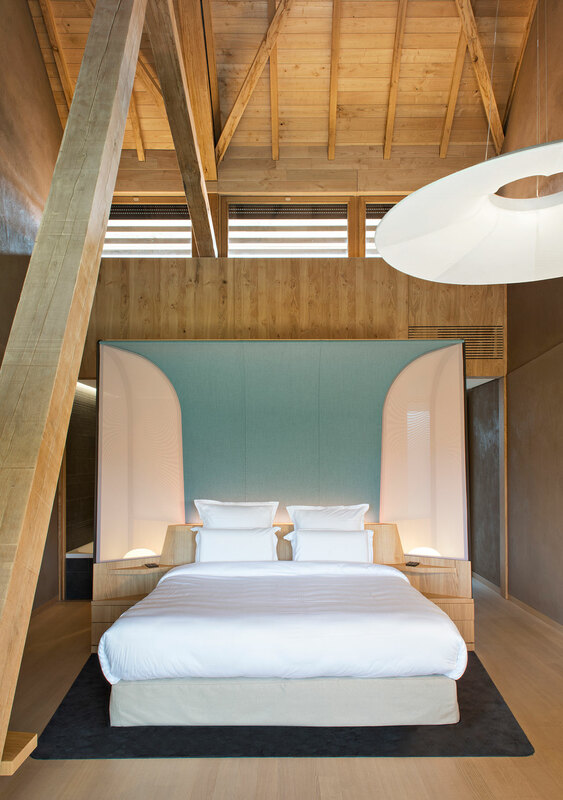 When (in 2016) the Haeberlin-Baumann family decided to add a new annex, The Spa des Saules, to their 150 year old family run Hôtel des Berges, located in the picture perfect French village of Illauhaeusern, Alsace, they turned to the design team of Patrick Jouin and Sanjit Manku. 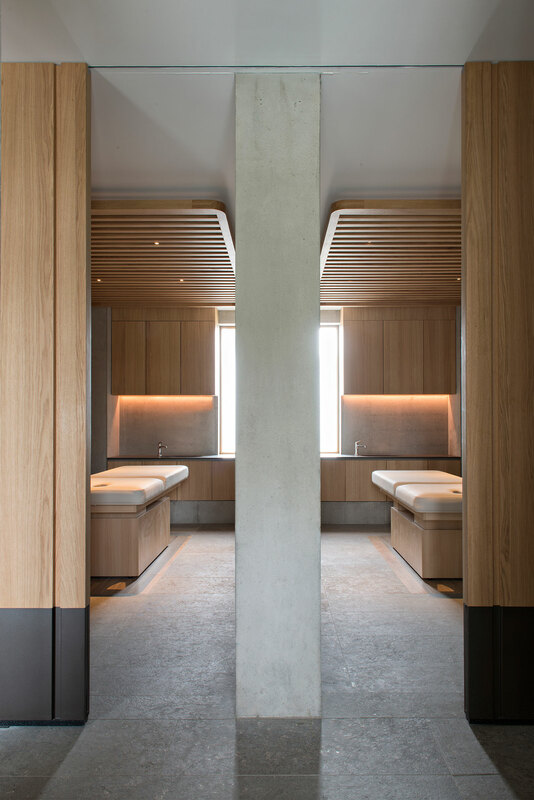 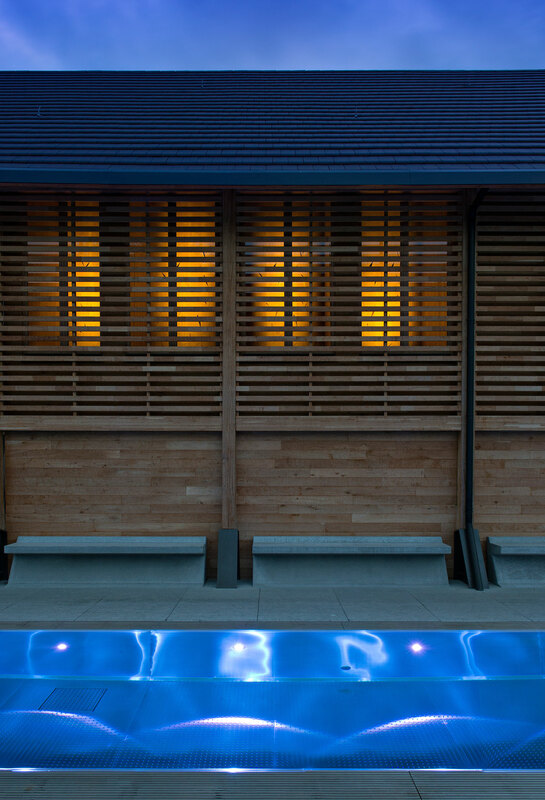 Previously commissioned to redesign the hotel's three Michelin stared restaurant back in 2007, the family knew that the designers would be able to manifest their vision for the spa spectacularly. 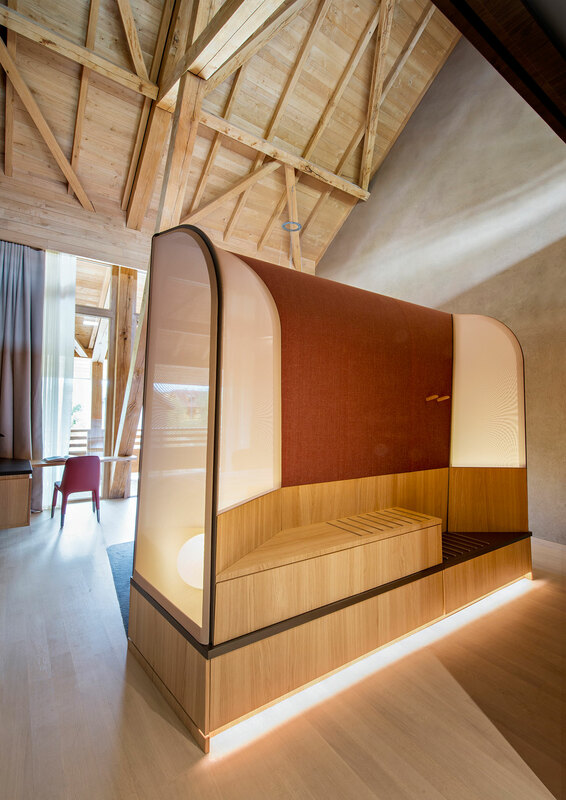 The vision itself was based on offering guests a restful and relaxing experience. 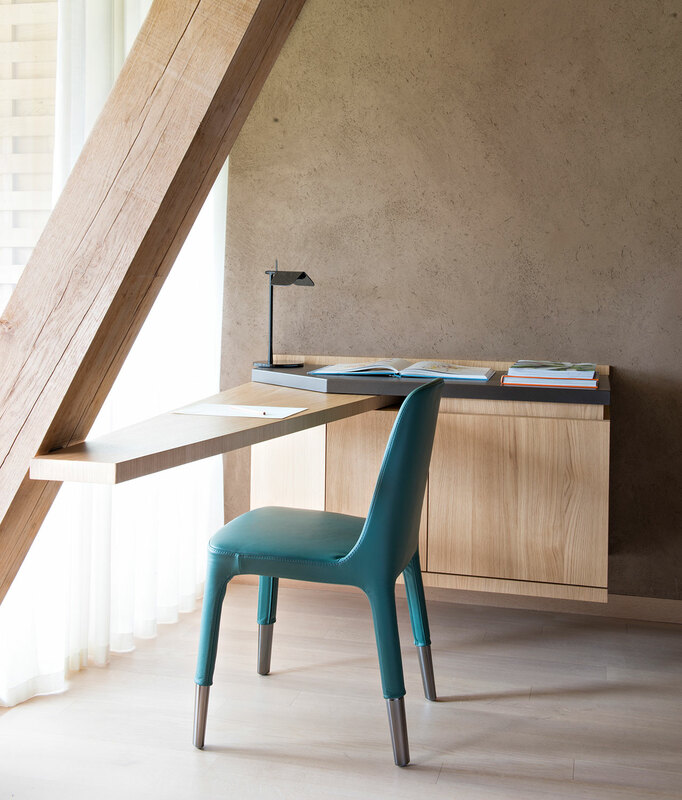 For the designers, a pared down structure harmoniously in tune with the property’s beautiful surroundings - with gardens designed in collaboration with Silvio Rauseo - proved to be the perfect foil. 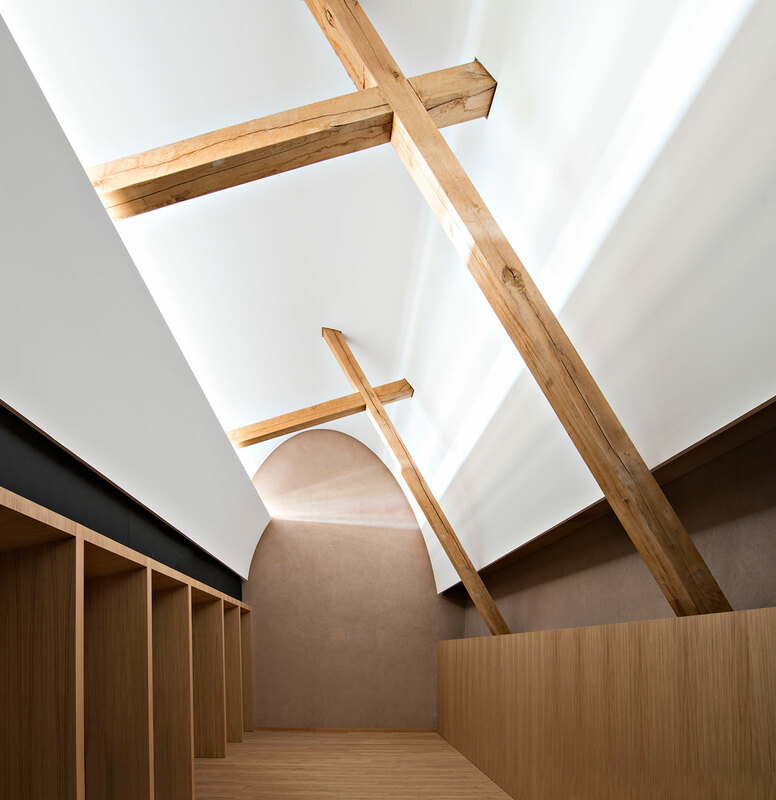 Reflecting the sturdy timber frames and straightforward scheme so common in the region's large old barns, the new annex - built with untreated materials - was comprised of a solid timber structure with a dark gray tiled roof, set in a concrete volume and further solidified into the ground through a smooth stone base. 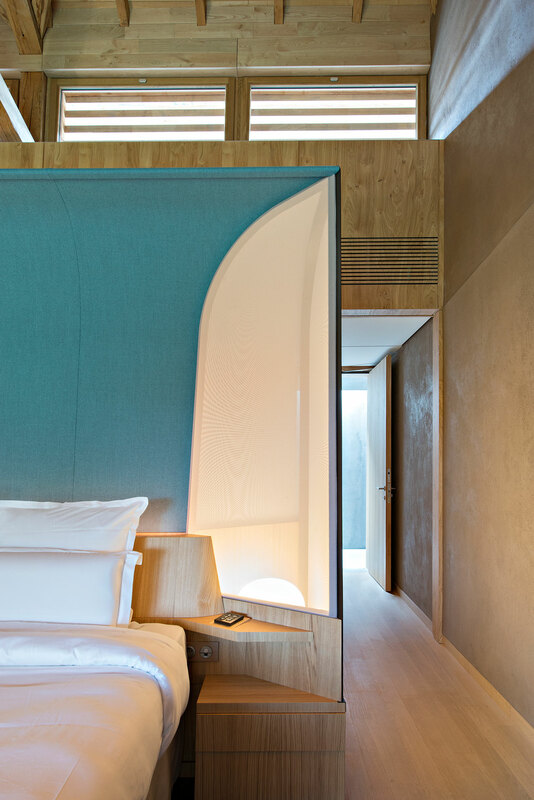 The five Junior Suites which are located upstairs all feature seven meter high ceilings, a floor plan of 40 square meters and simple, oversized furnishings; the large beds placed in the very center of the room being the indisputable focal point. 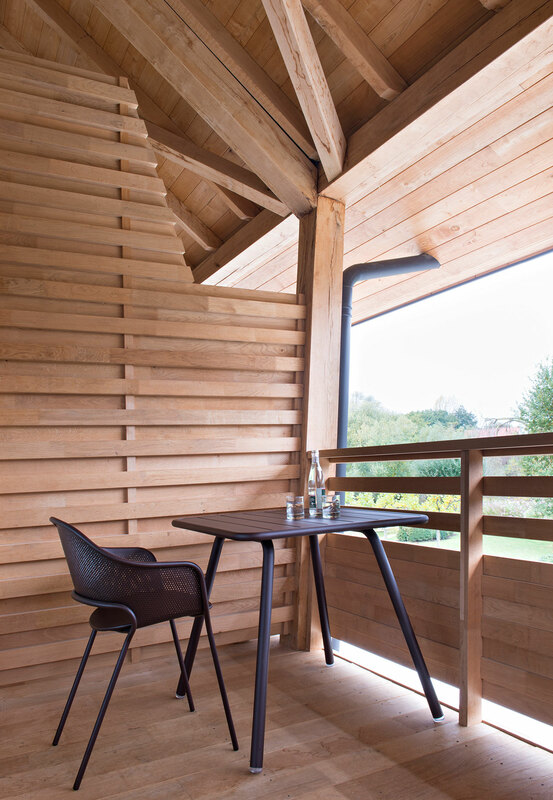 All elements, such as the thick oak plank used for the desk and the "monolithic" black stone bathrooms, bring to mind the natural state of things, further exemplified by terraces as well as windows which allow the bright light and enchanting views to flood inside. 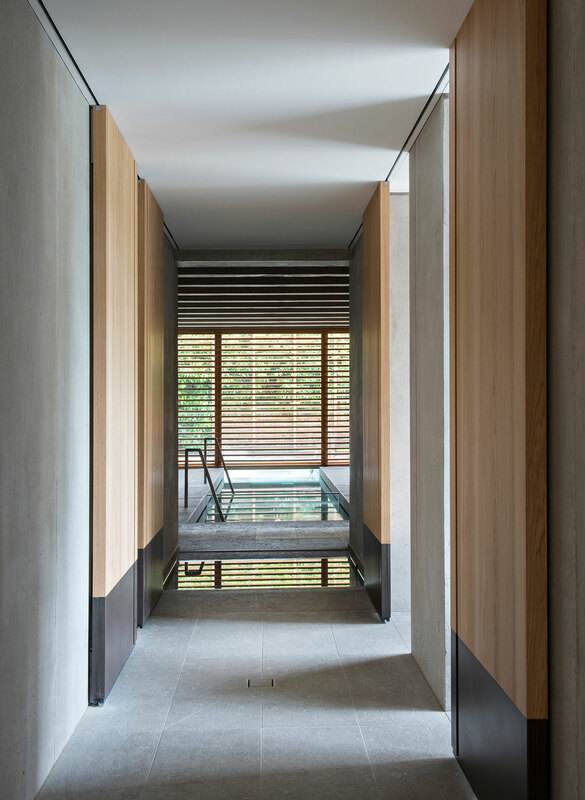 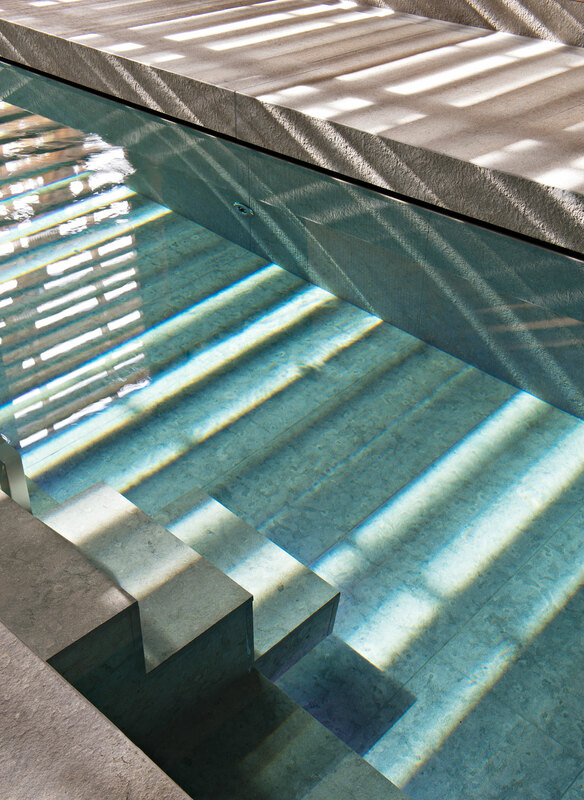 Guests are tempted out of their private sanctuaries by the beckoning of the mineral spa on the ground floor, with its relaxing Roman bath-inspired treatments and organic design. 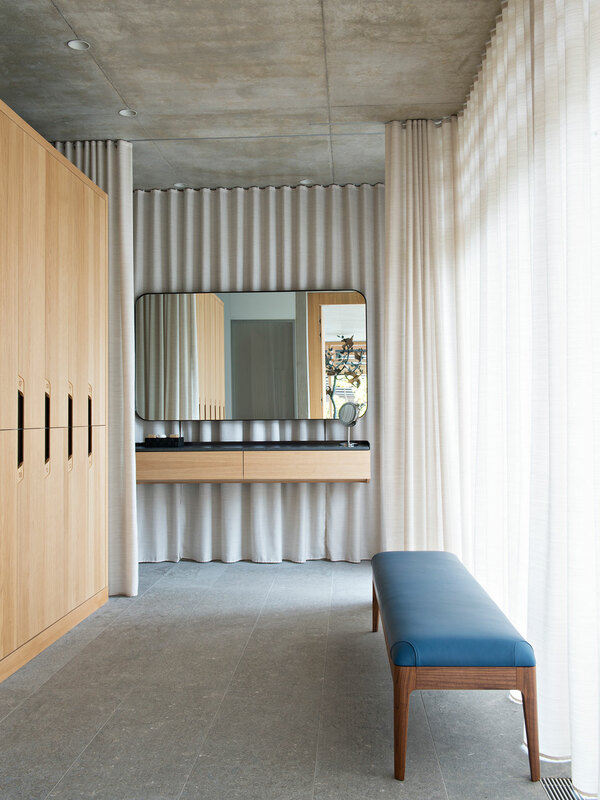 In here, the designer's intent was to create a space that looked timeless; as such, each element - such as the suspended dressing tables and smoked glass doors - exists because of its purpose. 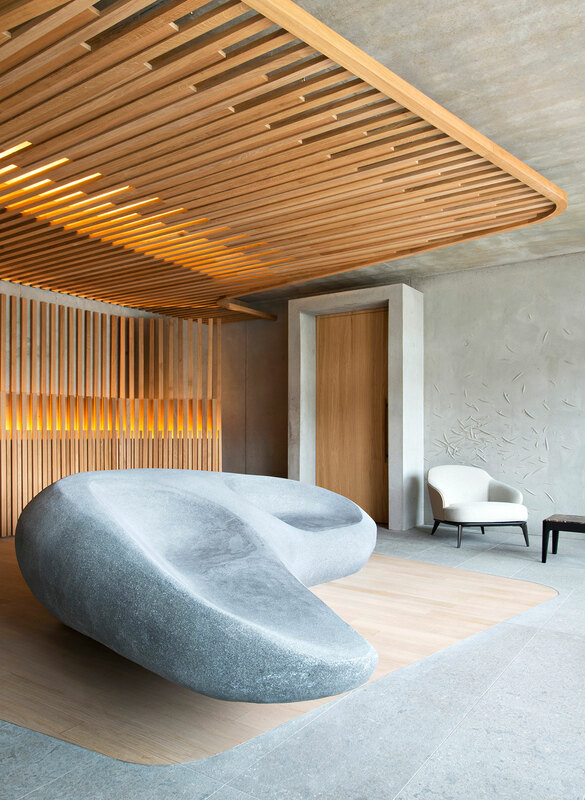 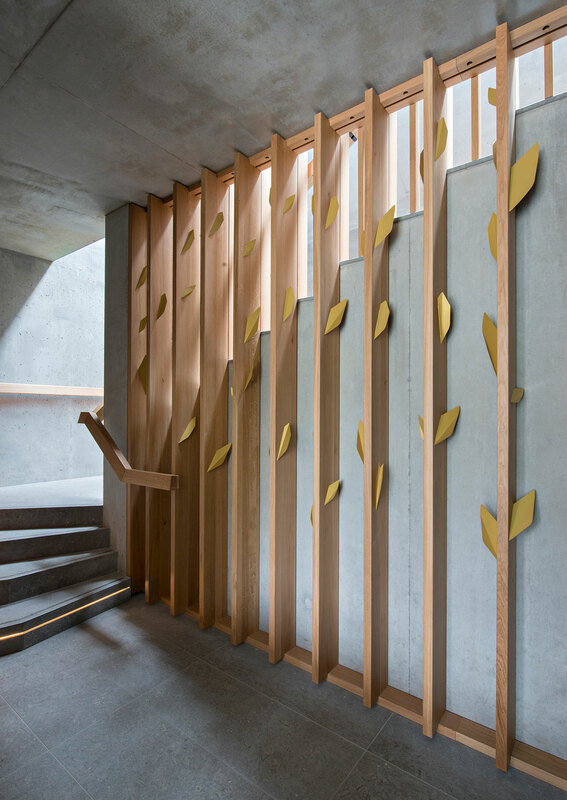 The only decorative motif is that of an abstract willow branch, which the designers have used as a way to once again reference the property’s natural surroundings, specifically the weeping willow trees that gracefully enrich the spa's grounds. 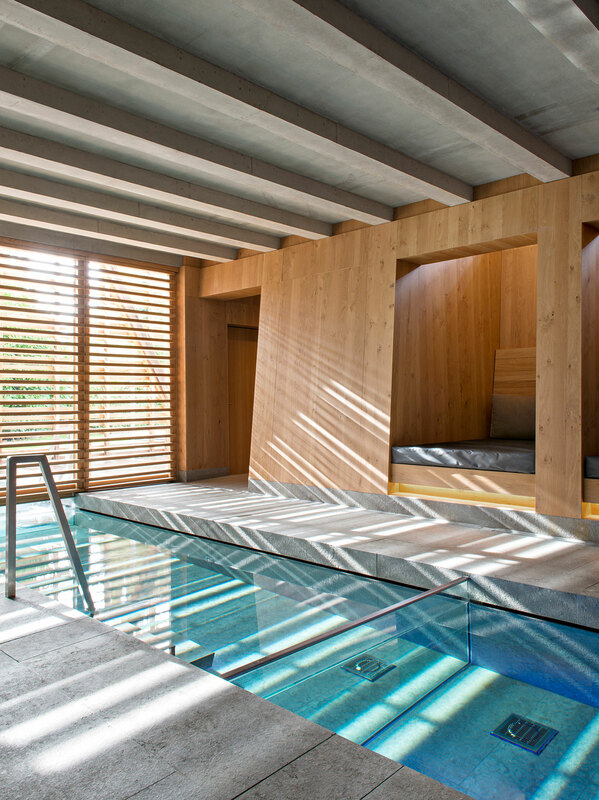 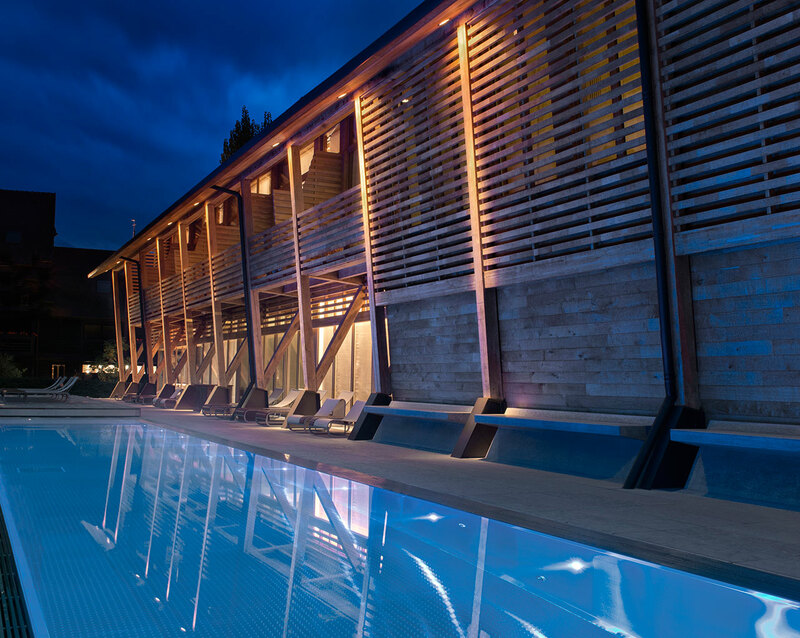 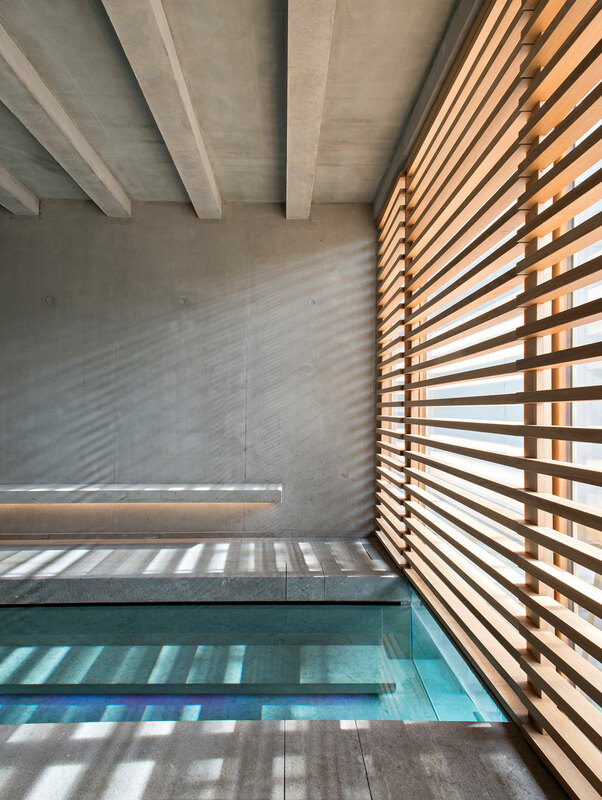 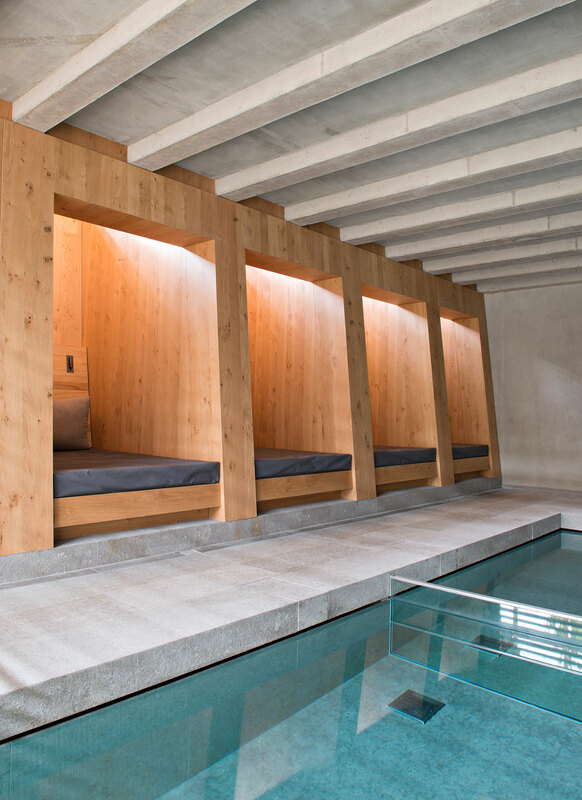 Each of the three pools - one indoor, one half-in-half-out, and one outdoor - provide a unique experience which can be tailor made to suit individual guest's needs. 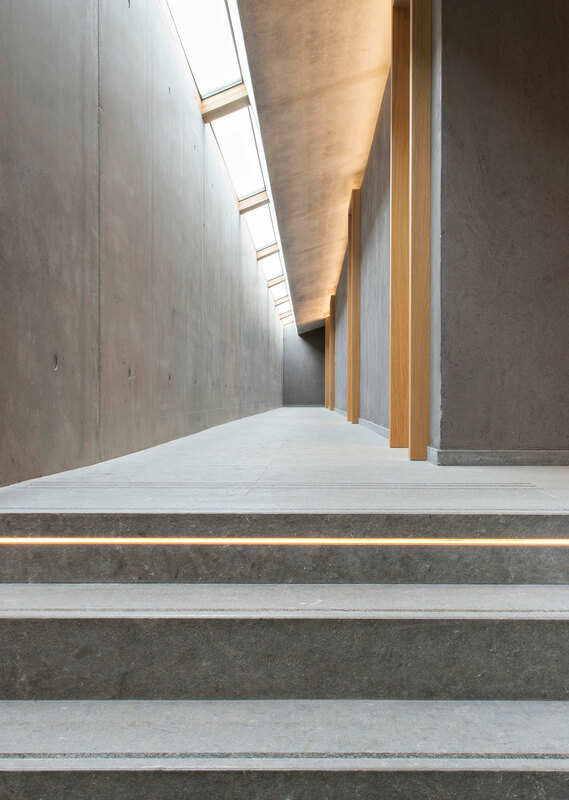 But the item that perhaps most personifies the entire project is the massive concrete "hot stone." 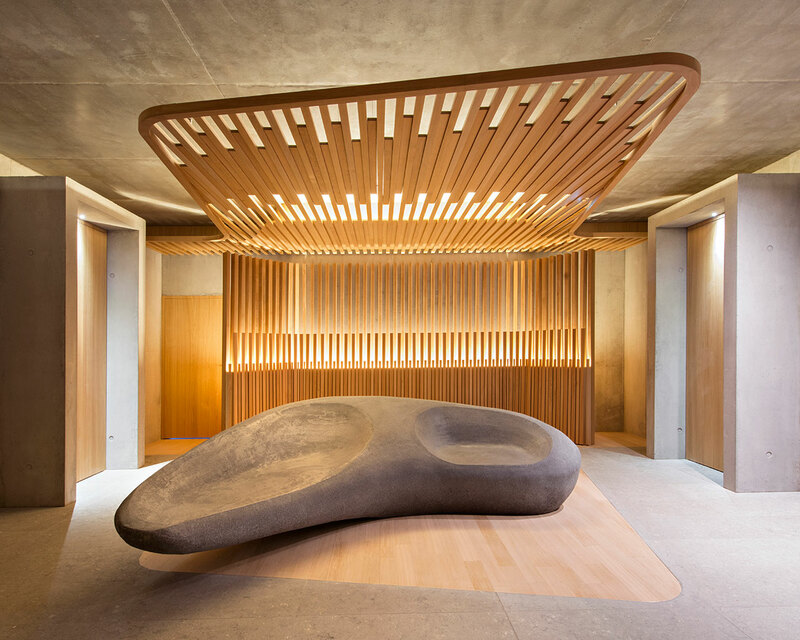 Located in the heart of the relaxation rooms, the sculpture's fluid curves invite guests to embrace its soothing warmth, either by sitting on it or by the simple act of touching it in passing, ultimately reflecting the underlying purpose of Spa des Saules: a welcoming respite and bucolic adventure with a meaningful purpose.